The Software Product Inclusion Agreement is used when you are providing copies of software (demos, beta releases, full versions, etc.) for inclusion in another companies product. One example of when to use this agreement is when a product is included as a component of another product such as a collection of demos on another companies CD-ROM to be included in a book. This Software Product Inclusion Contract is included in editable Word format that can be customized in Word or by using the included Wizard software. How do you write a Software Product Inclusion Contract document? This Licensing Agreement (the "Agreement") is entered into this Current Day day of Current Month, Current Year by and between Company Name, a State company (hereafter "Licensee"), and Company Name, (hereafter "Company"). This Agreement shall begin on Start Date and shall terminate on End Date, unless terminated for any reason by either party upon thirty (30) days prior written notice. 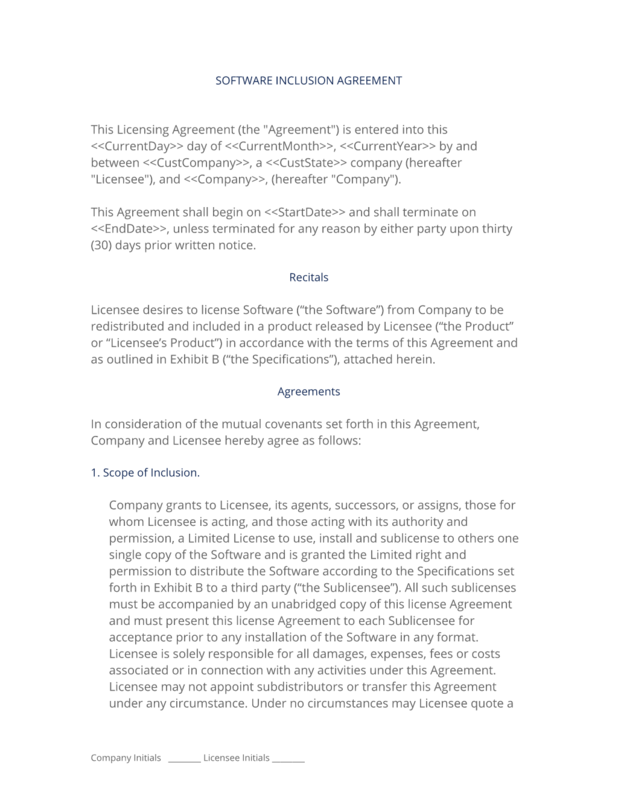 Licensee desires to license Software ("the Software") from Company to be redistributed and included in a product released by Licensee ("the Product" or "Licensee's Product") in accordance with the terms of this Agreement and as outlined in Exhibit B ("the Specifications"), attached herein. Company grants to Licensee, its agents, successors, or assigns, those for whom Licensee is acting, and those acting with its authority and permission, a Limited License to use, install and sublicense to others one single copy of the Software and is granted the Limited right and permission to distribute the Software according to the Specifications set forth in Exhibit B to a third party ("the Sublicensee"). All such sublicenses must be accompanied by an unabridged copy of this license Agreement and must present this license Agreement to each Sublicensee for acceptance prior to any installation of the Software in any format. Licensee is solely responsible for all damages, expenses, fees or costs associated or in connection with any activities under this Agreement. Licensee may not appoint subdistributors or transfer this Agreement under any circumstance. Under no circumstances may Licensee quote a separate fee for or a value ascribed to any component of the Software provided to Licensee by Company under this Agreement. The Licensee will pay Company the following license fees under this Agreement as outlined in Exhibit A (the "Payment Terms"). Licensee's Product may only be copyrighted in whole or in part so long as Company's rightful copyright notice(s) are displayed and credited, and a copy of this license Agreement is included with Licensee's Product. Failure to display Company's copyright notices will constitute a breach in this Agreement. Company does not grant Licensee the right to use Company's name, logo(s), graphics, text, testimonials, quotes or other Company-owned material, in connection with Licensee's Product, other than the inclusion of the Software and presentation of this Agreement, unless otherwise agreed upon in the Specifications. Licensee acknowledges that Company retains all rights, interest and ownership in the Software. At no time will Licensee attempt to derive or be able to assert any title or interest in the Software other than the rights and licenses granted under this Agreement. Licensee may not modify, disassemble, decompile, or otherwise reverse engineer the Software or any component thereof at any time. Either party may terminate this Agreement at any time for any reason, with or without notice. Upon termination of this Agreement, all rights granted to Licensee herein shall immediately cease, and Licensee must immediately cease distribution of the Software and remove all copies of the Software from circulation where applicable. Licensee acknowledges that the Software or any component therein may produce unexpected results or errors and may not be suitable for all platforms, computers, systems or otherwise. Use of the Software by Licensee or any Sublicensee is at their own risk. Company is not responsible for any down time, lost files, improper links or any other loss that may occur during the installation or use of the Software. Licensee agrees to indemnify and hold Company harmless from any and all claims brought by any third party relating to any aspect of the Software, including, but without limitation, any and all demands, liabilities, losses, costs and claims including attorney's fees arising out of injury caused by Software, copyright infringement, or Licensee's Product. Further, Licensee agrees to indemnify Company from responsibility for problems/disruptions caused by third party services or tools that Licensee may use such as installation software, demos, trials, delivery systems, servers, merchant accounts, shopping carts, shipping, hosting services, real time credit card processing and other services that relate to the distribution, delivery and inclusion of Company's Software in Licensee's Product. Licensee acknowledges that the Software and its inclusion in Licensee's Product are subject to United States export control laws and regulations. Licensee agrees not to export any Software, component, or other material owned by Company, whether directly or indirectly, to any country or end-user that is subject to United States export restrictions. Licensee shall not import Software into any country, except as permitted by the laws and regulations of the applicable country. This Agreement shall be binding upon and shall inure to the benefit of Licensee and to Licensee's successors and assigns. Nothing in this Agreement shall be construed to permit the assignment by Company of any of its rights or obligations hereunder to any third party without Licensee's prior written consent. This Agreement shall be governed by and construed in accordance with the laws of the State of State. Exclusive jurisdiction and venue shall be in the County County, State Superior Court. The prevailing party shall be entitled to recover its reasonable attorney fees and statutory costs. To any portion of this Agreement declared unenforceable, that portion shall be construed to give it the maximum effect possible, and the remainder of this Agreement shall continue in full force and effect. The complete Software Product Inclusion Contract - with the actual formatting and layout - is available in this Contract Pack.